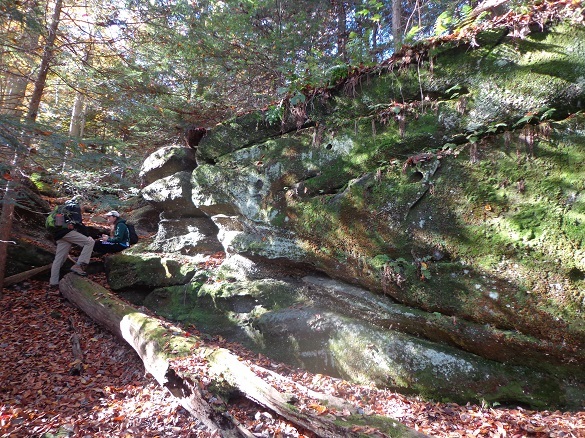 VIRGINIA KENDALL, CUYAHOGA VALLEY NATIONAL PARK (CVNP) — What an absolutely awesome day for geology in the field!! One of my geologic mentors once told me that “every day in the field is a day of vacation”, and today proved to be just that day. Late October…temperatures above 60 degrees…with the fall colors everywhere!! 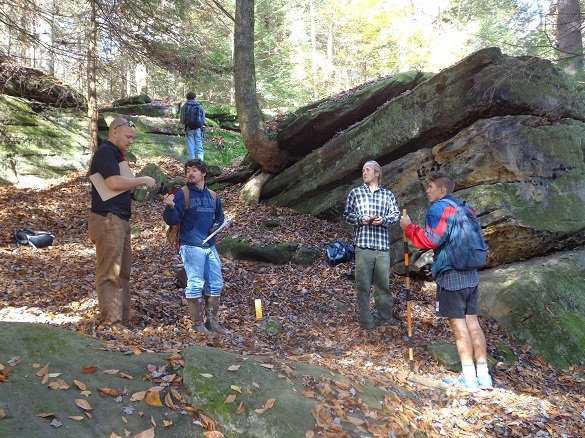 I could not have asked for a better day to take my Structural Geology class to “The Ledges”, part of Virginia Kendall, which is only about an hour north of campus. Essentially, we have a National Park right in northeast Ohio, and fall is the best time to visit the area. However, we were not just going there for a day hike. We were on a mission. I set up a scenario for my class: CVNP exposes strata that in the subsurface is rich in oil and gas. The goal for the students was to undertake a complete geologic study (including the stratigraphy, sedimentology, structure, and geomorphology) of the exposed rock in the area as an analog in order to better assess oil and gas fluid migration in the subsurface. The class was split into two teams — seniors vs juniors. Each team is not permitted to talk to one another about data collection, analysis, or synthesis. Eventually, these Research and Development (R&D) Teams will share their findings with Wooster’s Production Experts (Drs. Pollock, Wiles, and Wilson) via a poster presentation later in the semester. So, while there were literally hundreds of people out for a day hike near The Ledges, Wooster’s geologists were busy at work. 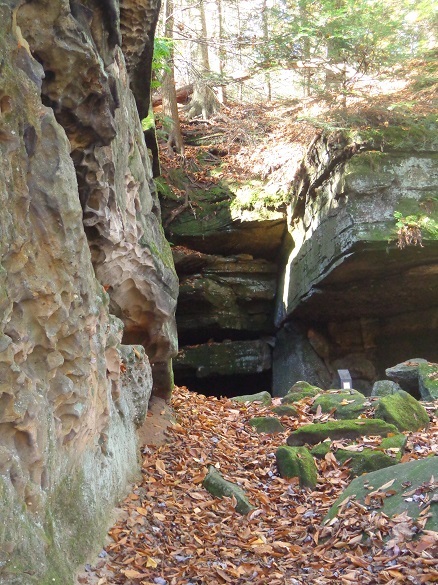 The Ledges is located just south of Happy Days Visitor Center and southeast of Peninsula, OH. The area between State Route 303 and Kendall Ledges Road (where there are all the green hiking trails) was our field area for the day. 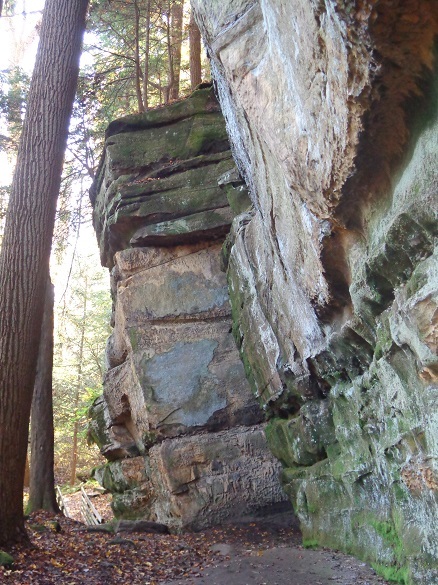 The R&D Teams quickly noticed the amazing joint sets that are exposed all along The Ledges. Essentially, we have ledges in this area due to the large fracture system (i.e., joints) affecting the rocks. These joint sets are very easy to measure and to access due to a wonderful trail system next to the exposures in Virginia Kendall. Notice above that these joints can be at various orientations and that those in the photo above appear to be nearly perpendicular to one another. Let me introduce the R&D Team of Woo seniors (’15), from left to right: Coleman Fitch, Zach Downes, Willy Nelson, and Leo Jones. It appears that they are discussing their team’s strategy early in the day. Michael Williams (’16), of the opposing team, is in the background. Is Michael trying to eavesdrop on the opposing team? Two members of our R&D team of Woo juniors (’16) are taking notes on this rock exposure. Eric Parker (left) and Kaitlin Starr (right, white hat) appear to be focused on the gorgeous geology. 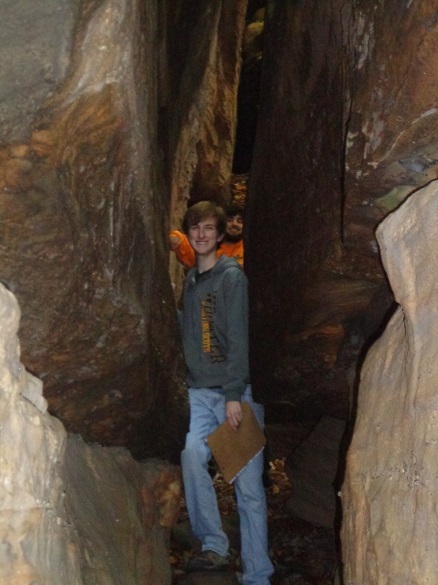 The other two members of the R&D team of Woo juniors (’16) were found hiding in a dark “slot canyon” among the joints. Michael Williams is in the front, while Adam Silverstein is in the orange hoodie, peeking out from deep inside the “canyon”. It appears that the juniors are separated from one another!! It is OK; everyone had maps and GPS units, so perhaps their strategy for the day was to divide and conquer? 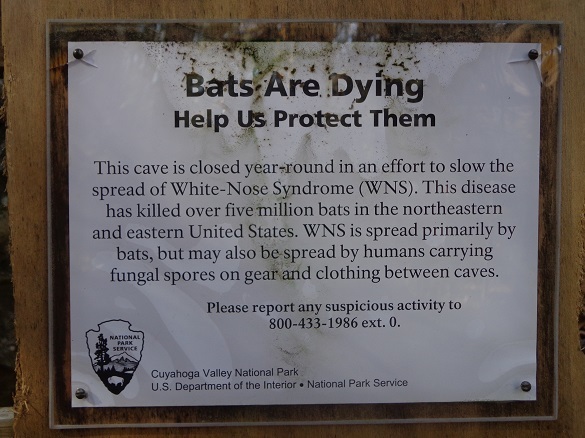 …the National Park Service is trying to save the bats, which are susceptible to White-Nose Syndrome. Now, I could not just end the blog without showing you such a wonderful photo. Check out the amazing set of cross-beds that you can see exposed in the upper half of the photo. These rocks, which are some of the youngest rocks exposed in CVNP, have been interpreted to be deposited by ancient stream deposits. 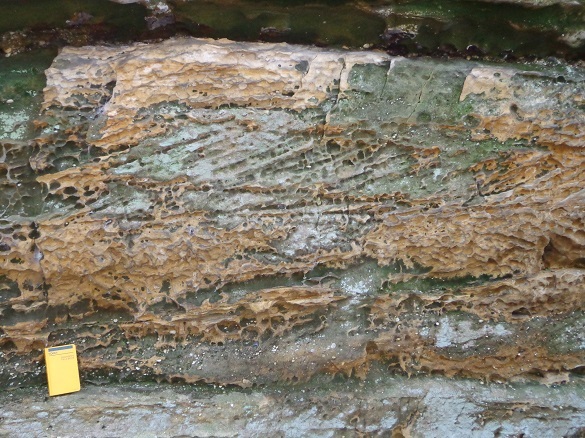 Superimposed on the cross-bedding is the characteristic honeycomb weathering that affects many of the sandstone exposures along The Ledges. And, notice that some of the rocks appear to be more brown or rust colored; some scientists have identified limonite and pyrite (two iron-rich minerals) in the unit. What an awesome day to be a geologist!! Who else gets to spend a great fall day with friends, enjoy the weather, learn a little more about rocks, and measure joints along the way? Geology rocks.